Hanna House We Care Outreach faith based residential home. Class of Housing: faith based residential home. Hours: Mondays through Thursdays 9am to 5pm. Residential long term Recovery Support facilities consisting of a Men's Recovery House, a Women's Recovery House, and a house for families and women with children. - "Blessing Closet" - used clothing. - Recovery Support Services / Case Management. - Drop Mailbox for homeless to get mail. 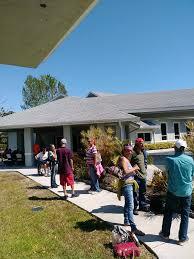 - ACCESS Florida community site - allows for sign-up for public assistance. - "Day of Hope" Outreach to Lee County Homeless. Be a volunteer. Call Hanna House We Care Outreach at (239) 693-7311 for current volunteer work opportunities. Posting Comments below is for viewers on this website only. If you have information that can help users regarding Hanna House We Care Outreach, please provide it below.